When you write a book, placing your trust in only one working copy of your manuscript on the internal storage of your computer is inviting disaster. Apart from file system issues, there are also other nasty possibilities. You might accidentally overwrite, copy, move or delete files, your hard drive could crash, a system update could fail, or someone might even steal your computer. To keep your manuscript safe, take the following simple file management steps to make sure you will never lose all your hard work. Now you can work on writing each chapter in its own individual Word file. This is a good writing habit to get into to avoid problems with large files. Even if the worst happens and a file gets corrupted, it will only affect one chapter file and not the whole manuscript. There are many options to safeguard your creative work and book files. 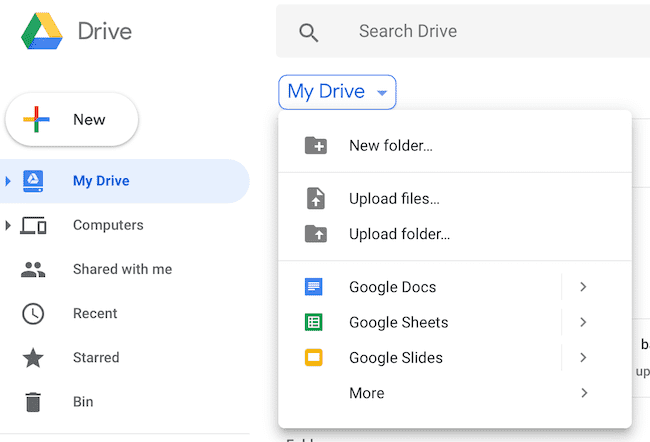 You can use a thumb drive or sd card, or a free version of cloud drive services such as Dropbox, Google Drive, OneDrive, or iCloud Drive on a Mac. Cloud storage takes very little time to set up, and most work with all types of files. You can either upload and copy your folder to one of these or in some cases; you can set up automatic syncronising. 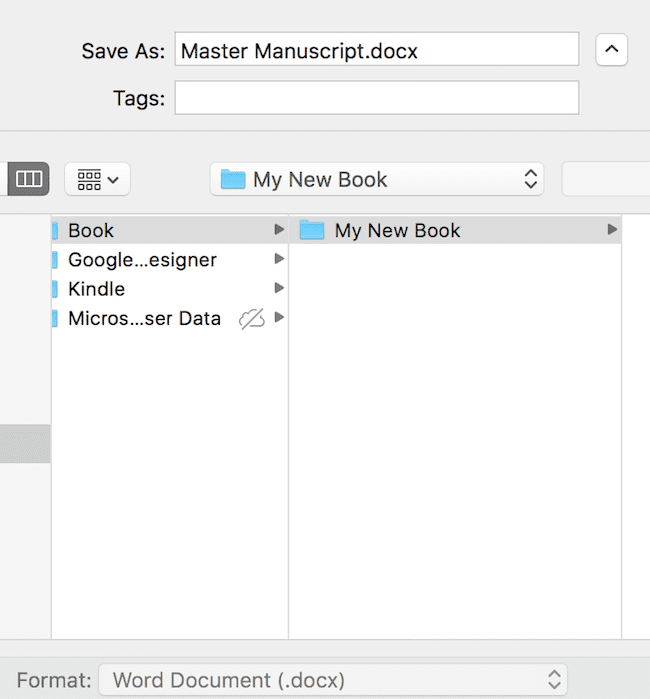 An extra line of protection is to create a new folder in your file management app and save a timeline of versions of your main manuscript document. Adding a date to the end of the file name helps you keep track. 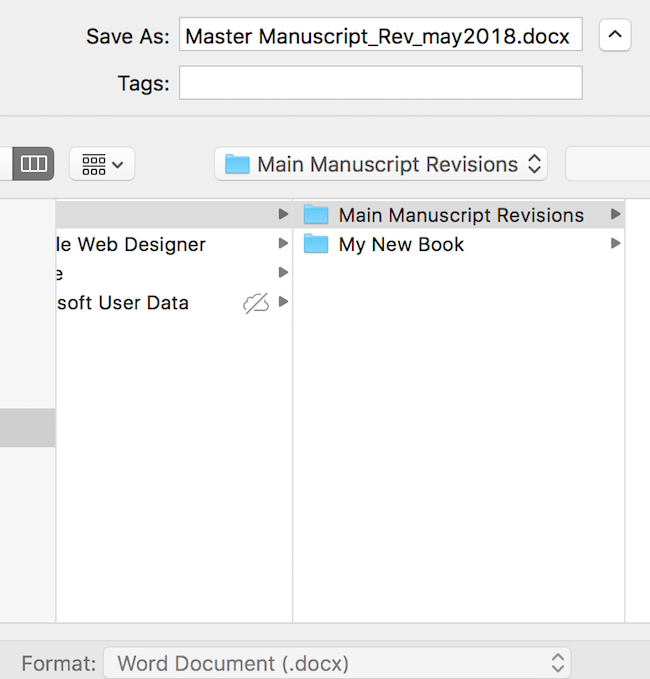 Using ‘Save As‘ instead of ‘Save‘ is the best way to protect your versions as it creates a new file, but your main manuscript file will remain intact and unchanged. This is great advice! I use Dropbox as a backup for my files, but this makes more sense, thank you. Great advice. I hate to admit how many times I have lost files due to corruption errors or I over-rode the files by using the same name. I have a separate backup drive that is constantly updating. Would still recommend saving copies on thumb drives? Great advice. 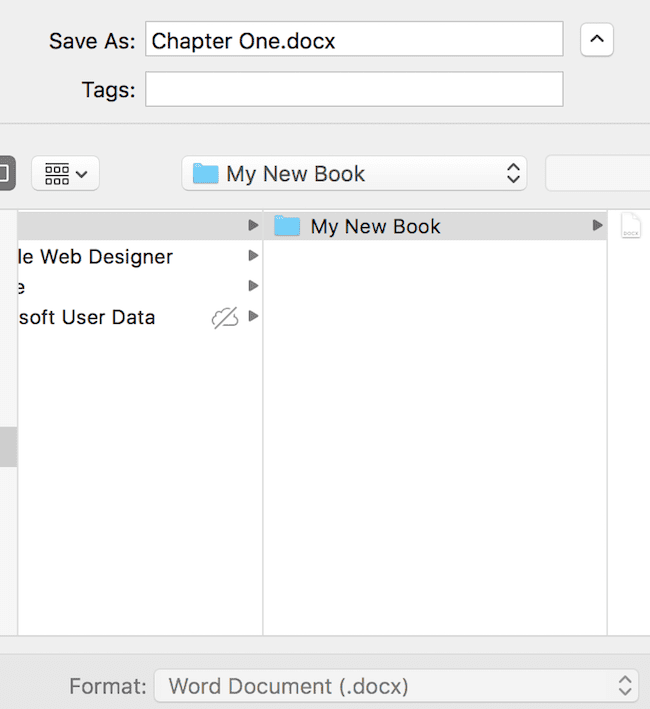 This past winter, my Windows computer crashed and I lost a full manuscript (needed one chapter to finish). Thankfully, an ex-cop buddy was able to retrieve my files off my destroyed hard drive. I made the switch to Mac, and haven’t looked back. But now, I’m paranoid, saving files multiple places and backing up my system. It only takes one time to teach us the valuable lesson you’ve laid out here. Hopefully everyone who reads this follows your advise or has already done so. Imagine writing a 90,000 word novel and have it all go away. It has never happened to me but it could and because of that nightmare I save everywhere. One big plus for me is that I write long hand at the beginning. That’s another way of saving it. A writer should have at least three or four places stored at all times. Or use Scrivener. It can do automatic backups and if you use it in conjunction with Dropbox you get versioning too. Added bonus of this setup is that you can close your project on your PC or Mac and open it on Scrivener for iPad, and vice versa. Just to be super safe you can use an automated backup program, like SyncBack, to do a nightly backup of your data onto an external hard disk or network drive. I agree. Scrivener is the obvious choice here. It does what this author is trying to do manually.